There's a thousand-plus ways to break down and disassemble one's view of the 2019 NCAA Tournament bracket. So here's another. We here at CBS Sports want to help give you as much insight to help you figure out which way you should lean when making your picks. With the NCAA Tournament's first round a day away, it's time to shine a light on the 1 seed of each seed line. Yes, the best 16 teams on every line are highlighted below. This isn't about easiest region or simplest path or anything like that. Just the best team, pure and simple, as I see it -- and what the metrics back up. And if you haven't yet seen it, I ranked the entire field from 1-68. Study up here, then go enjoy the tour of the tournament's 2019 population right over here afterward. Top Team -- Gardner-Webb, South Regional. Easily the best of the 16 seeds -- and this is Virginia's opponent. Funny how that works. The Runnin' Bulldogs are in the NCAAs for the first time in school history. Tim Craft's team ranks as top-50 in 2-point and 3-point percentage. When you're looking at No. 16 seeds, it's normally tough to see how one stands out from the others, but the metrics pretty clearly indicate Gardner-Webb is the tops. Top Team -- Colgate, South Regional. The Raiders are dancing for the first time since the days of Adonal Foyle, who was a Golden State Warrior long before it was cool to be a Golden State Warrior. Colgate is 24-10, makes 39.1 percent of its 3-pointers, has an aesthetically enjoyable passing offense and is led by a sophomore point guard in Jordan Burns who dropped 35 in the Patriot League final vs. Bucknell. Top Team -- Yale, East Regional. The Bulldogs have never had a better offense in the history of their program than what Miye One (a lot of buzz about him being an NBA player) and Co. have built this season. Yale's among the trendiest No. 14 seed upset picks in the past decade, far as I can tell. James Jones' team seldom has eyes bigger than its stomach. It doesn't rely on the 3, rather, it continually fills up from 15 feet and in. The method works. This is pretty clearly the best No. 14 seed. Top Team -- Vermont, West Regional. The Catamounts rate better at KenPom than St. John's. Vermont has a future pro in Anthony Lamb and is the best defensive rebounding team in the field. John Becker's been terrific over the past seven seasons; he's due for a bigger school to come calling any day now, it seems. Vermont has depth and is a fun watch. I barely take it over UC Irvine as the top No. 13 seed. Top Team -- Oregon, South Regional. This one feels inarguable. The Ducks needed a Pac-12 Tournament title to even get in the field, but on a neutral court against any of the other 12 seeds (Murray State, Liberty, New Mexico State), Oregon is definitely giving points. The Ducks are flawed but do have athletes -- meet freshman Louis King and sophomore pogo stick Kenny Wooten -- and defend the perimeter well. I'd be surprised if Wisconsin manages to take more than 10 3-pointers total in its game Friday afternoon. Top Team -- Belmont, East Regional. The Bruins clear the bar for me easily here. A double-digit win over Temple in the First Four -- when star Dylan Windler only had four points -- only reemphasizes my belief. Rick Byrd's team is the second-highest scoring team in the tournament and rates second in the field in 2-point percentage. Belmont makes 59.7 percent of its 2s; only Gonzaga's 62.3-percent rate is better. At 27-5 and with a well-greased offensive scheme, it's not hard to see why Belmont is a trendy pick to beat Maryland. Top Team -- Iowa, South Regional. Weird set of 10s this year, I think. I'll ride with an Iowa squad that has been sputtering but nonetheless has a nice complement of size down low (Luka Garza, Tyler Cook) with 3-point shooting. Plus, the Hawkeyes have had a flair for the dramatic, winning multiple games at the buzzer this season. Top-15 offense, and I'm not a massive buyer on Seton Hall. Gimme the Hawks. Top Team -- Washington, Midwest Regional. The Huskies are coming off an embarrassing loss in the Pac-12 Tournament title game. That said, Washington is 26-8, and third in block percentage and second in steal percentage in college hoops. The zone is a problem for teams -- and Matisse Thybulle might be the best all-around defender in college basketball. Jaylen Nowell is a top-100 NBA prospect, too, and Noah Dickerson can rebound and bump with almost anyone in college hoops. Pac-12 wasn't good, but Washington is the best of the No. 9 seeds. Top Team -- Utah State, Midwest Regional. Easily the best of the 8 seeds. Utah State won the regular season and conference championships in the Mountain West under first-year coach Craig Smith. The Aggies are a terrific defensive rebounding team, are willing passers and rate as the third-best defensive rebounding team in the tournament. (Vermont and New Mexico State are better.) The Aggies have just one loss (at San Diego State) since Jan. 9. Top Team -- Nevada, West Regional. Nevada does not have nearly the depth it expected to at the start of the season, but the size, athleticism, experience brings them to the tournament at 29-4. It doesn't turn the ball over much and does have two of the 30 best players in America: Jordan Caroline and Caleb Martin. I think Nevada's got a strong chance, despite less-than-ideal bracket positioning, of making it to the second weekend for the second consecutive season. Top Team -- Buffalo, West Regional. Easy call. Buffalo should have been a 5 above Mississippi State and Marquette. The Bulls do not beat themselves. They are well-coached, experienced, relentless and truly play with an anger (in a good way) that is reminiscent of the Wichita State team that made the 2013 Final Four. The Bulls run the third-fastest offense in America -- then grind opponents down on the other end. Crazy energy and stamina from this team. It can beat Texas Tech. Top Team -- Auburn, Midwest Regional. Color me surprised that I've got Auburn here -- because I also have Auburn losing to New Mexico State -- but I do think the Tigers are the best of their crop. Wisconsin, Marquette and Mississippi State are the other three 5 seeds. Wisconsin at this point is the only team with a viable case, but Auburn's a better team from deep, has more consistent guard play and is the No. 1 turnover-forcing team in college basketball. They're basically even with Wisconsin in KenPom. I like Auburn just a bit more. Top Team -- Florida State, West Regional. The Seminoles program has never had a better season in the ACC than this one. FSU is 27-7, having won 15 of its 20 games against ACC competition. The 'Noles rate 14th at KenPom and have the No. 9 defensive efficiency in college basketball. Their only two losses since Jan. 20 have come against No. 1 seeds -- UNC and Duke -- and both of those were away from home. Florida State has pro-level size and athleticism. There are other good No. 4 seeds, but FSU is clearly the best. Top Team -- Houston, Midwest Regional. Guard-oriented team that is elite defensively, excels in the half court and is coached by a man who's made the Final Four. That's a winning recipe. Oh, and Houston's won 31 of its 34 games. If you tracked my Power Rankings throughout the season here at CBSSports.com, you saw Houston was in the top 15 over the past eight weeks. A Final Four-capable team, no question. Top Team -- Tennessee, South Regional. There is a great case to be made for Michigan State, but I will go with the 29-5 team that has the No. 3 offense, the SEC Player of the Year (Grant Williams) and a multifaceted powerhouse in Admiral Schofield. Throw in the speed of Jordan Bone, the savvy of Williams and the length of Kyle Alexander, I like what Tennessee offers on the whole. It went 2-1 vs. Kentucky. The SEC title game blowout to Auburn was bizarre, but I won't let that lapse sway me. This is the best Vols team in school history. Top Team -- Virginia, South Regional. It's going to take a Final Four appearance for a lot of people to accept Virginia's place at the top of the sport, I suppose, but this team has rated No. 1 in multiple advanced metrics for about half the season. Right now, Virginia's efficiency margin at KenPom sits at +35.62, which is nearly three full numbers ahead of No. 2 Gonzaga (32.78). 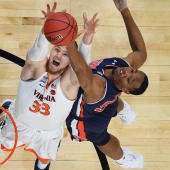 Virginia is the best team because it is the best two-way team and has never had an offense this good under Tony Bennett nor a trio this solid (De'Andre Hunter, Ty Jerome, Kyle Guy). Visit SportsLine now to see which No. 3 seed reaches the Final Four, and see who cuts down the nets, all from the model that nailed 12 of the 18 double-digit upsets in the first round the last three years!